Price: $$ - Starting at around $350 a night per person - remember it is all inclusive! Best tip: One of the things I despise when it comes to all-inclusive resorts is having to wear a wristband. Thankfully Secrets is wristband free. Secrets Resort run two hotels in Montego Bay that are directly adjacent (and literally connected) to one another. While in Jamaica I stayed at Secrets Wild Orchid and noticed no perceivable difference between the two hotels. I could walk freely from one side to the other and we were able to eat at all restaurants through-out both properties. Basically, they are booked under two different names but are connected to make one giant hotel. A representative from Secrets answered a TripAdvisor Forum question asking the difference between St. James and Wild Orchid. They explained in detail the concept of the two hotels. I have copied and pasted the entire comment in full below (in case that link ever disappears). Or you can click the link above to read it yourself. Q: What is the difference between Wild Orchid and St. James. I see they are on the same property, but what is the main difference between the two? Is one newer then the other? A: Kindly note that neither property is older than the other. I have provided generic information below and invite you to view our website for additional details and features. Both properties are absolutely fabulous and have different décor that will appeal in a different way based on your personal style among other factors. Kindly note that Secrets Wild Orchid and Secrets St James are located next to each other and both Resorts feature our exclusive Unlimited-Luxury package. 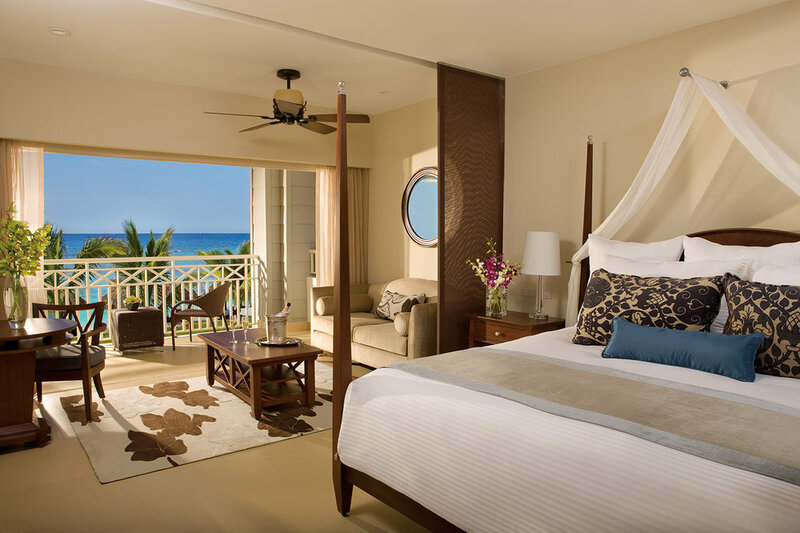 The 350 suites Secrets St. James Resort, is modeled with Jamaica’s history in mind and features eye-catching British Colonial-style architecture and elegant décor in warm tones with dark wood accents. Oversized four-poster beds, extra-large showers, Jacuzzi’s for two, private balconies and Secrets’ signature discrete room service (Secret Box), along with access to our glistening pools and magnificent ocean views. On the other hand Secrets Wild Orchid , boasts a contemporary and chic design and sits serenely on a half mile of private beach on the Montego Bay Peninsula. This 350-all suites resort takes inspiration from the island surroundings with its warm neutral tones and unique endemic art. Select suites at our property do offer private, swim out access to a private pool just off the suite’s back patio. Kindly also note that all our Preferred Club suites are furnished with a Whirlpool tub and a soaking tub on the balcony, with the exception of our Preferred Club Master and Presidential Suites which have an actual Jacuzzi on the balcony. Guests booked In the Preferred Club room category have the extra privilege of enjoying a more tranquil and relaxing environment with more privacy and upgraded amenities at their disposal. The Suites available for this booking category are furnished with more exquisite décor, more personalized services as well as reduced disturbance from other guests due to the fact that there are intentionally less Suites in this area. Preferred Club facilities are restricted to Preferred Club members only. Please also be advised that once you book any of these resorts, you have access to both; Restaurants, bars, pools, gaming lounge and the beaches are shared by both properties and are closer to guests booked at the Wild Orchid Resort. It should also be noted that the Wild Orchid is closer to the main areas. Guests booked in the Junior Suite Ocean Vie room category will not have access to the Preferred Club or it’s associated amenities. I hope the above helps,but please let me know if additional information is needed. I have mixed feelings about this.... I am almost always going to say no to all-inclusive resorts over normal hotels and experiences. Jamaica is a generally safe country if you stick to the cities and don't wander at night. I have an entire article about safety concern in Jamaica here. I encourage you to see what the local restaurants and shops have to offer. I notice that if you stay at an all-inclusive resort you don't see the 'real' destination. That being said, I did stay at Secrets in Montego Bay and had a kinda good experience. When it came to the location and layout of the hotel, it was very nice. Tons of pools to relax at, tons of cabanas on the beach to chill at all day. The food, in my opinion, was only ok. And when it came to vegetarian options they were mediocre to downright laughable. What does Secrets include at their all-inclusive resorts? I will say that Secrets includes a lot of extra amenities in their all-inclusive packages. For starters, you have unlimited access to a range of dining options with most restaurants not requiring a reservation. I get ridiculously annoyed when I visit an all-inclusive resort only to find out that you must make reservations for any of the better dining options. They fill up fast and then you are stuck eating close to midnight (if you can get a reservation at all). When it comes to drinking Secrets offers unlimited international and domestic top-shelf drinks. The cocktails I did try with heavy on the juice so you may want to stick to simple drinks like vodka tonic or rum and coke to actually get a buzz going. When it comes to activities there is a wide array of daytime and nightly live entertainment to choose from. We saw sooo many things to do, so just to name a few: Ping-Pong, volleyball, bicycle tours, lit tennis courts, morning yoga, pool tables. You get the point. They also have a couple of activities that are an added expense but are easily booked right on the resort. We used Secrets to book Scuba Diving and had a fantastic time. They also have deep sea fishing and glass bottom boat tours you can pay to join. One of our favorite FREE activities we loved was the ability to kayak, take a catamaran out, or stand up paddleboard while on the property. Along with everything I listed above you also get unlimited soft drinks and fruit juices, a mini-bar that is refreshed daily with a wide array of beverages, and pool and beach wait service. Like most hotels, maid service is daily and Wi-Fi is included (though I did find it a bit slow). Luckily, Secrets is only a 15 (at most!) minute drive from the airport. I suggest simply hailing a taxi once you arrive - there is an easy line to get in so you aren't ripped off. You definitely SHOULD NOT use Secrets car service. They offer it on their website through a third party I believe and it is extremely overpriced, and quite frankly a ripoff. They are charging $140 for a roundtrip private transfer which is ridiculous. You can get a private transfer from other companies for only $40 for a regular car and $80 for an executive car. Seriously. I suggest booking through Paradise Travels Jamaica - we used them while in Jamaica and couldn't have been happier. While visiting Jamaica in June 2018 we had the chance to stay at Secrets Montego Bay in one of their Junior Suite Ocean View. I will say while this sounds like an upgraded room, it was actually the lowest room quality available. I thought they were just playing up the name of the room but it did feel like a suite. We had an oversized living room along with an adjacent (no wall) bedroom with a huge king-sized bed. It also included a private furnished balcony which was nice to relax on. The bathroom was gorgeous as well with a shower and tub. I was pleasantly surprised with Secrets rooms. WiFi is included with your stay. But, I had an awful time connecting. The signal was constantly dropping. If you were anywhere inside the resort - especially the beach - a signal was almost nonexistent. In the room, the signal was unfortunatly barely usable. I could barely check e-mails let alone add updates to social media. And definitely forget about streaming Netflix while there - it's not going to happen. I mentioned this above, Secrets Montego Bay offers unlimited access to a range of dining options with most restaurants not requiring a reservation. I get ridiculously annoyed when I visit an all-inclusive resort only to find out that you must make reservations for any of the better dining options. They fill up fast and then you are stuck eating close to midnight (if you can get a reservation at all). I was not overly impressed by the food. Some meals were spectacular while staples like shrimp and steak were sometimes inedible. The vegetarian options were also abysmal. I truly don't understand why all-inclusive hotels have such a hard time offering veggie options. Take a look at the gif to the right of a salad I ordered to the room. Montego Bay is a gorgeous city full of so much to do and see. No matter what type of activity you are into Montego Bay has something for everyone. Seriously, I couldn't believe how awesome it was. Why didn't I include Dunn's River Falls? Because I think you should visit the Blue Hole instead. Read why here. 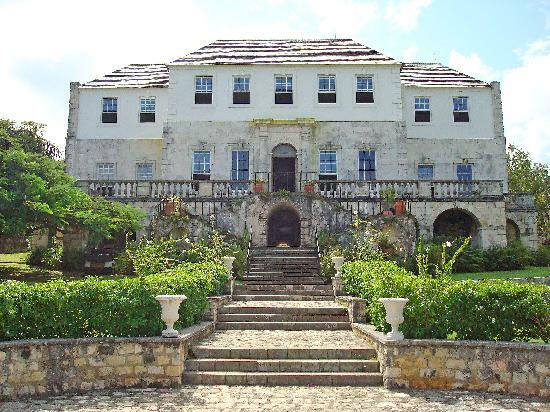 Don't forget that even if you aren't staying in Montego Bay you can still visit it from surrounding cities. For example, Ocho Rios is less than 2 hours away from Montego Bay and Negril is only 90 minutes. When we visited we were actually staying in Montego Bay and got a private driver for the day to take us to all of the attractions in Ocho Rios. And I know that hiring a private driver sounds uber expensive but it actually wasn't! We went with the company Paradise Travel Jamaica and it was totally worth the money. Honestly, there are a ridiculous amount of things to do off the Secrets resort and I definitely suggest exploring Jamaica - it's beautiful!! Here is a full list of all the best things to do. My final word on Secrets isn't a definitive answer - sorry about that. I do think some would have an amazing time here. But I also think the hotel may not be worth the money. Blue Hole VS Dunn's River Falls | Which is best?